A portfolio of solutions will be considered to achieve sustainable groundwater under SGMA. Projects and management actions can work in tandem to augment water supply and reduce water demand, stabilizing groundwater levels. The North Fork Kings GSA Board's first priority is implementing projects to increase water supply in the service area. The North Fork Regional Recharge Project introduced by Kevin Johansen, Provost & Pritchard, aligns with that priority. The project is in early conceptual stages. Three groundwater recharge basins with estimated annual recharge capacity of 15,000 AF (acre-feet) are included in the project scope, leveraging suitable recharge conditions in the GSA's northeast region. The average annual cost per AF of recharge is $160 according to preliminary project cost estimates. 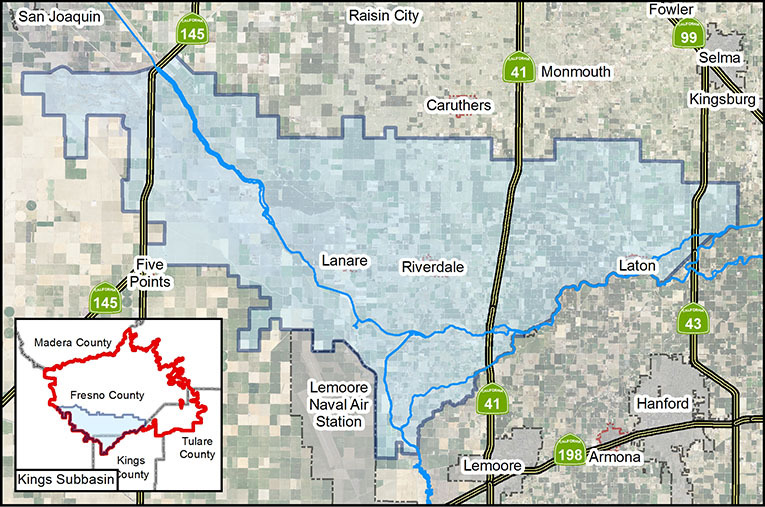 The project includes two new basins and expansion of an existing Laguna Irrigation District basin. An additional component needed is improvement and expansion of Liberty Canal to increase current carrying capacity and secure water delivery. Surface soil type, absence of clay layers, and groundwater flows at project sites are highly conducive to recharge that benefits the entire GSA's service area. The bulk of surface soils at proposed sites are coarse sands and sandy loam, ideal for percolation into the groundwater aquifer below. And although much of the GSA is underlain with clay layers, the northeast region is absent of these layers. Because groundwater generally flows east to west in the GSA, the groundwater recharged by the project would flow into the rest of the service area. This includes to disadvantaged communities of Lanare and Riverdale where soil type and clay layers are unsuitable for recharge projects. Please take this brief 4-5 minute survey to help us better understand and serve all users of groundwater in the North Fork Kings GSA. Sign-up below to the North Fork Kings GSA Interested Persons e-mail distribution list to receive notices of meetings and events. North Fork Kings GSA is a California special act agency formed by legislation to implement the Sustainable Groundwater Management Act in the southwestern part of the Kings Subbasin.